Front of card is a scaled reproduction of "Entering the Land", the 2000 Epic oil painting by Barbara Mendes. Children will love finding the tiny details in this card. 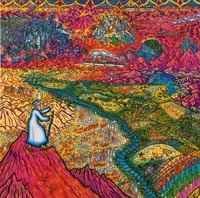 A panoramic view shows Moses looking out over the land of Israel, and seeing the future unfold to the present and beyond.